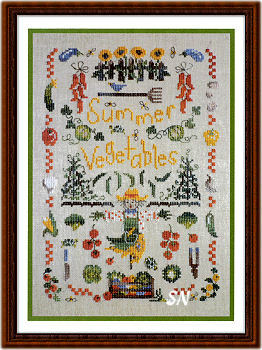 Designer Marielle Zang Pujol brings us a collection of Vegetable Garden and 4-Season Samplers full of simple design details. 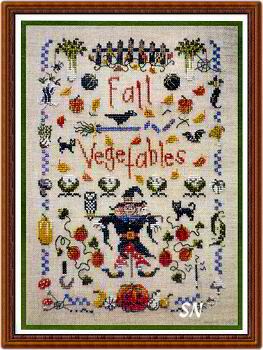 All offered in chart format, beautifully printed and presented, these are fun to stitch, because everything is changing all the time -- even the lovely shading from the Gentle Art Sampler Threads she uses! 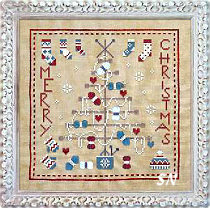 Filigram has a trio of fun needlework designs... one just a 'sewing sampler' and the other two -- fantasy Christmas Trees! Stitched on Vintage Country Mocha fabric (we have that color in several different counts -- aida and linen) with DMC shades of 3865, 355, 535, 840 and 931 or 924. 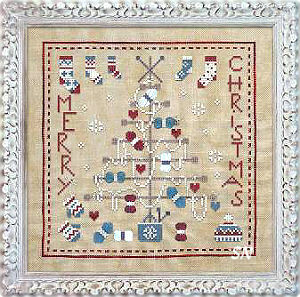 Cream, cranberry, denim and soft brown... each pattern has a needlework theme and is filled with tiny motifs. The Stitching/Sewing Christmas Tree has a tiny tomato pin cushion on it, buttons all over the place, tiny spools and of course thread that trails over allthe tree branches. Reels & Buttons would make such a fun sign for your sewing room or corner... replace the alphabet with info about YOU! The Knitting Tree is decorated with hanks of yarn, and the tree's base is a knitting box! Socks, mittens and hats decorate as well. 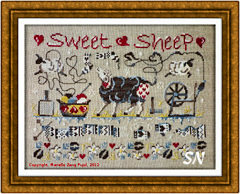 Each of the three pics finishes 115 stitches square -- on 32ct, that's only 7 x 7 in size. Presented as charts -- super cute! This is a pattern we've been enjoying in the shop for some time. I've just never highlighted it for you, and need to, because it's so cute! It is definitely a tribute to one who raises sheep, shears them, spins wool, knits with it, wears the mittens and scarves, or even counts sheep in their sleep! 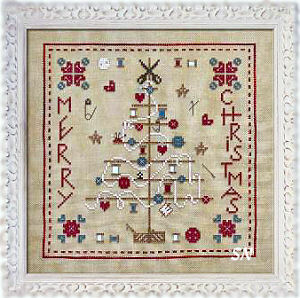 Offered as a chart, it finishes approx 6-1/2 x 9-1/2 on 32ct and is stitched with Gentle Art Sampler Threads or DMC. ... The Sun shine! 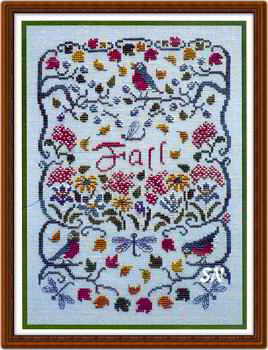 By Filigram, this is a light-hearted piece that is worked in regular Cross Stitch with Gentle Art Sampler Threads. Choose any fabric you want... the sample was worked on Natural linen. 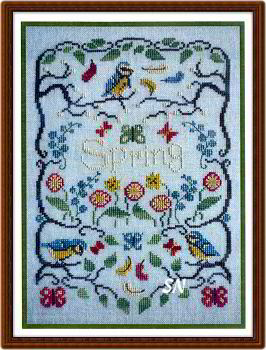 Stitch count is 261 x 44, so it'll be approx 3 x 18-1/2 on 14/28ct. The alphabet starts out at the left with the cloudy sky and the little wet snail... passes through the rainbow... and at the other end... sunshine and a buzzzzzy bee! Pretty colors, a fresh, cheerful design style, offered as a chart. 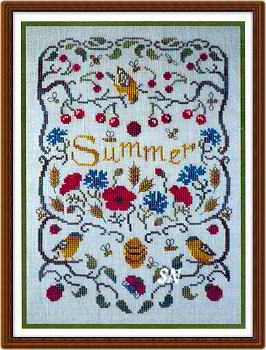 Presenting a lovely collection of the four seasons in flora and fauna! Petite pieces finishing approx 6 x 9 on 32ct, each is worked with its own selection of 6 colors of Gentle Art Sampler Threads -- but are coded for DMC cotton if you'd rather use that. The charts are beautifully presented in color -- so clear -- you could frame THEM! Look at each season. 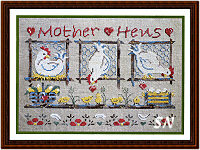 See all the different bands and birds that you could take out of these and stitch individually? Very simple, but really eye catching and charming... this has such a unique design flavor... we like them all! 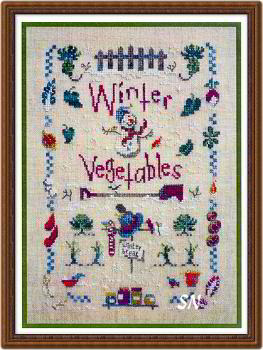 Filigram has also finished her 4-Season set of Garden Vegetables, too... more cute borders and tiny seasonal motifs await your stitching fingers! 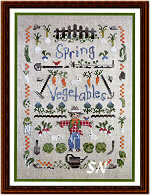 Spring & Summer Vegetables I love these matching seasonal garden scenes! 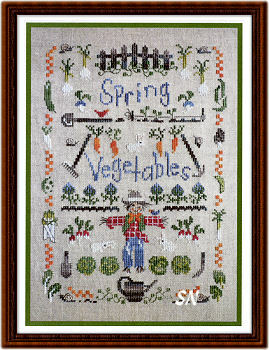 The picket fence that surrounds everything, all the neat and tended rows, the yummy fruits and vegetables, the shovels, spades, rakes and watering cans, and those darling scarecrows -- they rule the gardens! 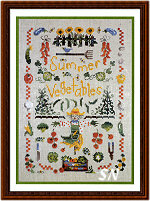 Very well done with lots of cute motifs that are very recognizable, the charts are printed in color. 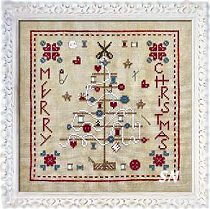 Coded for Gentle Art Sampler Threads or DMC flosses, these finish approx 6-1/2 x 9-1/2 on 32ct. What an awesomely contemporary and endearing scene! 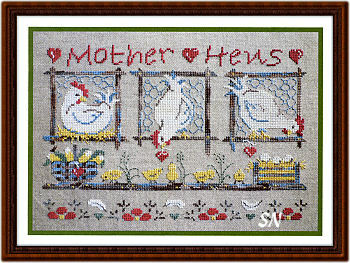 A trio of concerned Mama Hens are tending to their little chicks who are playing in the garden. A pretty, relaxed, loose design style, this looks young and fresh. 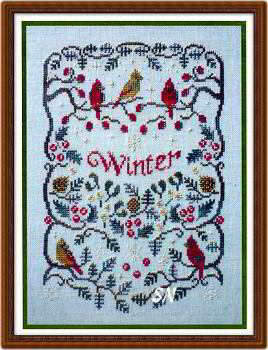 Charted for DMC or Gentle Art Sampler Threads, it has a stitch count of 151 x 105, so will finish approx 6-1/2 x 9-1/2 on 32ct. Very classy! Don't miss the other two new designs, shown below.